Cyclone Mahasen (BB-1) Position as on 12.30 am (IST)13th May : Location 10.7N and 86.6 E. Core pressure 996 and winds at 45 Knts. Precipitation expected on Sunday along TN coast, South AP coast and interior AP, adjoining Mah. MW-4 (Part-2) 2013...Seasonal Quantum Performance of SWM. Situation assessed after the arrival of the SWM..and the scenario mentioned below are after the Monsoon sets in. To take and assess the SWM performance, we refer back to the MW-4 (Part-1). We have to take into consideration most of the 15 parameters (Gowariker Method) before making an assessment, and these have to be analysed one by one. The prominent among the 15 are , ENSO, Mar temperatures of North India and East Coast, Himalayan Snow cover till March and SOI to name a few. Of-course, I am not going to take each and every one of the 15 here, but, derive at an estimate on these basis and on the new model developed. I hope readers of vagaries trust that I have tried my best to estimate as accurately as possible. a) Till July end, we can see normal rainfall and progress of the SWM in the Sub_continent regions. Normal conditions in the Pacific Oceans will send a few "pulses" to create "in situ" systems in the Bay, and the first 2 months will see around 3/4 noteworthy systems traversing the Sub continent. WDs will be few, hence, we can expect a few systems to track towards Central and Northern India, resultig in good rains in the plains of N.India and Central Pakistan regions..and fairly good above normal rains in Nepal. During the Northern track of the system, the monsoon trough could be pulled far North into the Himalayas, and possibility of "short "break Monsoon in 3rd week of July or near around thar time period. Break monsoon situations, and winds bringing in moisture from the Bay (diverted to the NW directions) will result in excessive rainfall this season in Nepal, more so the Eastern regions. NE states of India will get continuous feeding from the Bay. (Cherrapunji seems the likely candidate for the highest SWM rains). b) In such a scenario, even the Easterly 200 hps jet streams would move further Northwards. Could bring rainfall to Upper Pakistan regions. Hence, rainfall could be normal in rest Northern Pakistan and Kashmir. c) Due to systems reluctant to track southwards, we may see lesser rains in the Southern Peninsula regions. Even the support to the west coast (South of Mumbai)may be lesser than normal. 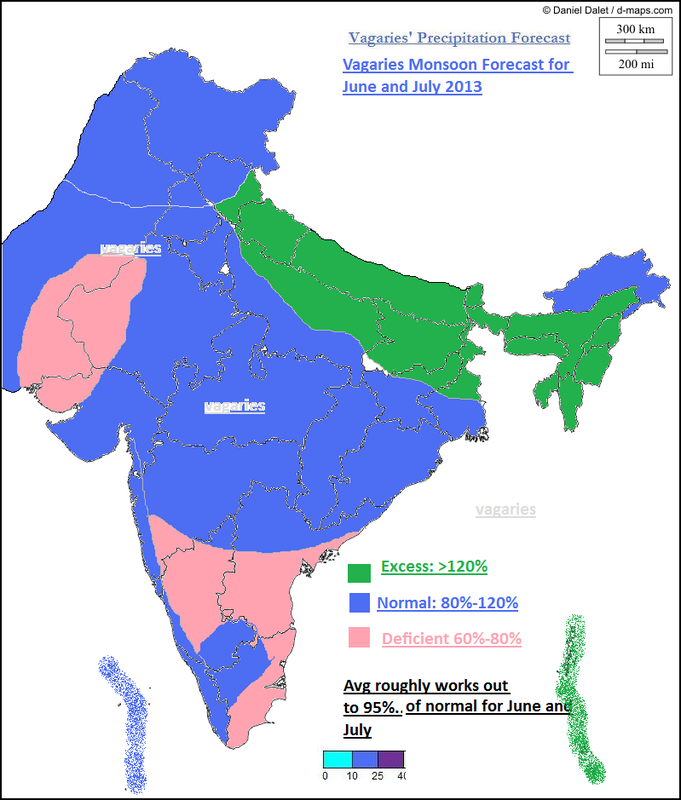 Hence, rain shadow regions in TN and interior Karnataka may be slightly deficient. However, normal gradient along the West coast will show rainfall along West Coast of India. Things, if and when they change (drastically) will be posted and Vagaries readers will be kept well informed, of any variation in the forecast. These are my personal views, and should be depended upon commercially or otherwise. They may differ from other models. Again very similar pattern South Indian rains are decreasing by every year. KARNATA may enter into 3rd or 4th year of successive droughts. KAR after years of BJP government - who have total disregard for environment - mining,deforestation,removal of lakes is out now. Let us see what Cong does now????? Dear sset, lets not start blaming politicians and lets stick to the weather. There are other forums for that. Excess rainfall possible for northernmost india and nepal. weak el nino phas has anything to do with this ? or is there some other condition that will play a part ? very hot here in Kathmandu the past few weeks. Day temp have climbed up to 32-33 C mark , continuously - its hot for this place - though many may just raise their eyebrows and say 'what's very hot about 32-33 C mark?,. Its hitting that mark on almost a daily basis - though nights are cooler - the coolest part of morning dipping typically to 14-15 C. Few thunderstorms in between - but nothing excessive, just a few once in a while to cool things off. RExpected rains commence in TN. From Pradeep (on vagaries fb page):Rainfall Impact from Mahesan on Chennai. in mm ending 6.30 am on 13.05.2013. Heavy rains has lashed many places in the city. 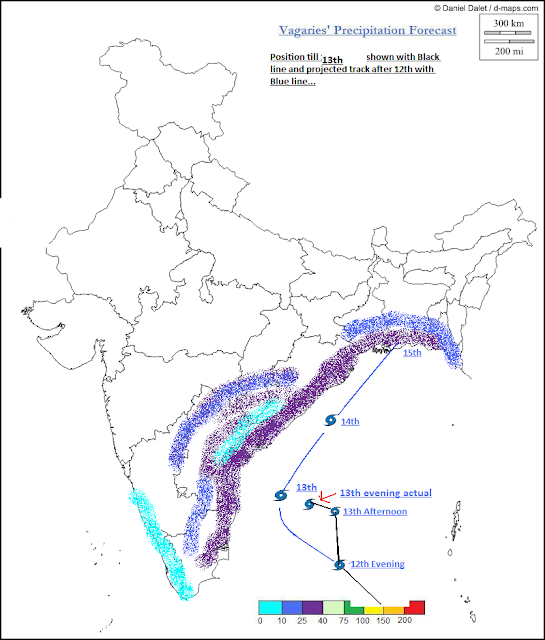 Cyclone "Mahasen" - Drifted W-N-W again, Nearing Chennai, South Andhra !! ?? and Cyclone Mahasen , Now its "Too closefor comfort" for North Tamilnadu and South,central Andhra coast...so it will hit indian coast or not? J&K: Max temp below normal by 5 to 10 c , min temp below normal by 0 to 3 c ..
Himachal:Max temp below normal by 7 to 15 c , min temp below normal by 0 to 5 c ..
Sundernagar:37 to 19 c..Manali:27 to 14 c..Shimla :28 to 15..Dharamsala:32 to 18 ..Kalpa:22 to 14 ..
Chandigarh : 41 to 28 c ..Ambala : 42 to 29 c ..Hissar :40 to 36 ..SFD:41 to 36 c..Ludhiana:42 to 29 ..Patiala ..43 to 30 ..
Rainfall was along the predicted lines by vagaries till 13th morning: Coastal AP,Orissa coastal plains, gangetic WB , Kerala,parts of Tamilnadu plains ..